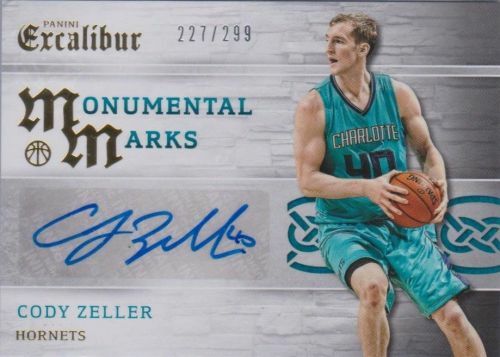 Transitioning over from the retail-only debut last year, 2015-16 Panini Excalibur Basketball returns with a traditional hobby format and the same basic elements from 2014-15. Premium hobby boxes promise three total hits. 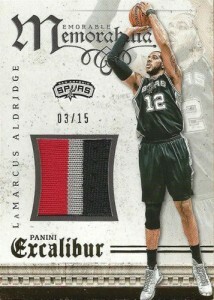 In addition to a regular base set, the real stars of the release might be the Crusades inserts that average 1:3 packs. Featuring rookies and veterans, multiple parallels and rarities offer a challenging rainbow that includes Gold, Green and Black along with print runs of 199 down to one-of-one. 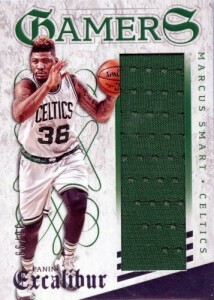 Signed options in 2015-16 Panini Excalibur Basketball include Rookie Rampage Jumbo Jersey Autographs that showcase the top first-year players with quality swatches and sticker autographs. Treasured Ink works with a refined design and highlights player's signature moves. Other choices include Regal Endorsements and Monumental Marks. 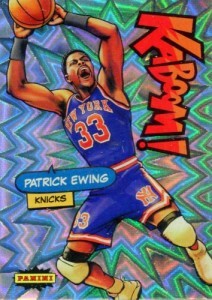 A very popular insert, Kaboom was a standout in previous releases due to a cartoon theme and considerable rarity. It returns with a fresh look at top NBA players at a rate of one per case. 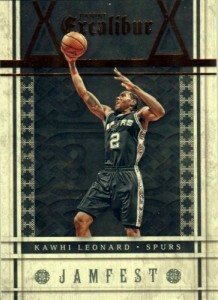 While Target is no longer the only place to find the product, there will still be a retail component to 2015-16 Panini Excalibur Basketball with both Blaster and Gravity Feed boxes. 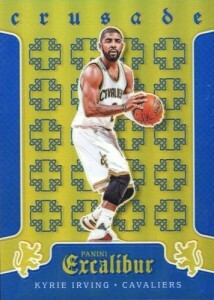 PARALLEL CARDS: Knight's Templar, Light Blue, Silver #/70, Gold #/25, Black 1/1. PARALLEL CARDS: Blue #/199, Red #/149, Purple #/60, Gold #/10, Green #/5, Black 1/1. PARALLEL CARDS: Prime #/7 or less. All subjects not included in parallels. View specific options with the full spreadsheet. 25 cards. Serial Numbered #/75. PARALLEL CARDS: Silver #/70, Gold #/25, Black 1/1. *Card not found in parallel. View specific print runs with the full spreadsheet. 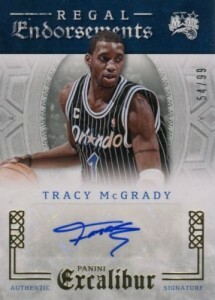 PARALLEL CARDS: Prime #/10 or less (card #14 - 1/1). PARALLEL CARDS: Prime #/25 or less. *Card only found in parallel. 32 cards. Serial Numbered #/49. I can’t wait for this product to hit shelves. I was always a fan of the Excalibur. The only problem was the price of the hobby box. Panini Crusades are my favorite insert and the numbered variety is nice. 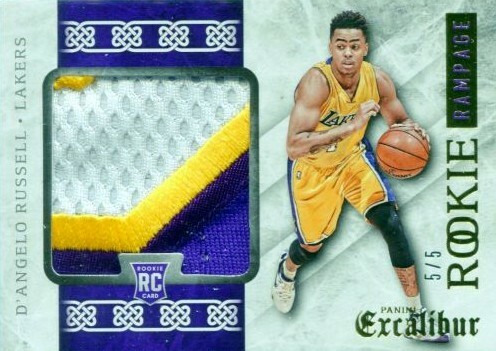 Although Nice Product somewhat I am More Prone to Not Purchasing this Product this year apposed to Last year because Vince Carter does not have any Crusade Cards, No Patches, No Auto’s Nothing but base and Paralel cards, Hell I can buy them B****** on Ebay……….. 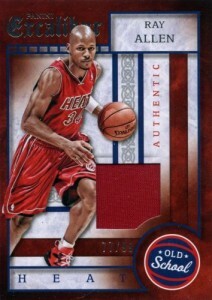 SO don’t even waste your money if you are a Vince carter Collector in this Hobby. Thanks a lot Panini for The Insane F***-Up. But 2014-15 Product was Just Insanely Great. Dumb luck – there was one solo gravity feed pack at Target, which I took and pulled a Chris Paul “Kabooom” insert – not bad for $5. The rest of the set is just okay. Too pricey for me. Nowhere near as nice as 2014-15 Excalibur. That might go down as the best retail product in basketball history.